Samsung has officially unveiled its latest Galaxy S series smartphones called the Galaxy S9 and Galaxy S9 Plus. These new flagships will be available in Global markets from March 16th. Now, ahead of its official launch in India, the company has already started taking pre-orders for these new flagship phones in the country. Interested customers can now head to Samsung’s official website and pre-book the phones. To do so, you’ll have to pay Rs 2,000 up front. The website shows three colors i.e., Lilac Purple, Midnight Black and Coral Blue. Unfortunately, there’s no word on the launch price of the new Galaxy S9 duo yet. In case you had any doubts, Samsung’s latest flagships feature some of the best mobile hardware out there. The Indian version of the phone will be powered by the company’s in-house Exynos 9810 processor. The biggest change in terms of hardware is in the improved cameras, which have variable aperture and improved AI scene recognition. The S9+ features dual-cameras, just like the Galaxy Note 9. 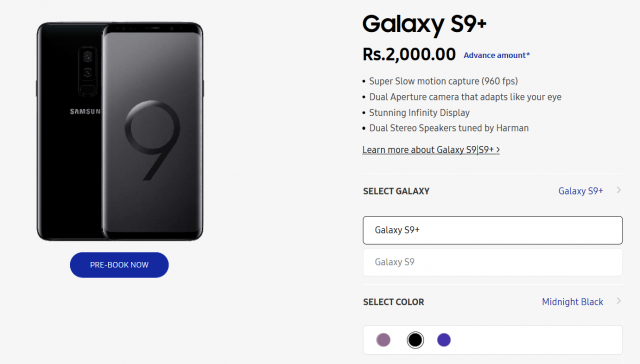 We’ll have more details on the Galaxy S9 and Galaxy S9+ Indian pricing in coming days. As of now, there’s no word on the launch date in India. But once the devices are launched in India, they’re expected to go on sale online on Flipkart as well.